To earn a living Howard Colyer tests software, but in his free time he is a novelist and playwright. His books include Gregory Gun and Oldshaw; his plays include Homework, Kafka v Kafka and an adaptation of The Overcoat by Gogol. In addition he has translated one book by Franz Kafka – Letter to my Father – which, by a small miracle, got reviewed on A Good Read on Radio 4. 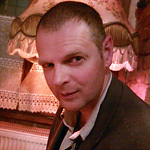 His most recent play, an adaptation of Mikhail Bulgakov’s Flight, was performed at the Brockley Jack in January 2014, and a film of the performance can be found here. His next, a version of Gogol’s Marriage, will be performed at the same venue from 24th June to 12th July: more details here.